Guy Hoskie Lapis Lazuli Graduated Row Bracelet size 7 1/8"
This is a bracelet that we commissioned Guy Hoskie to make for us. When we do this, we provide him with the stones and have him make the bracelets with hefty 12 gauge Sterling. This heavier sheet silver gives the bracelet a respectable heft which the fine stones merit and, perhaps more importantly, this thicker silver allows for deeper stampwork which enhances the textural beauty of the cuff. 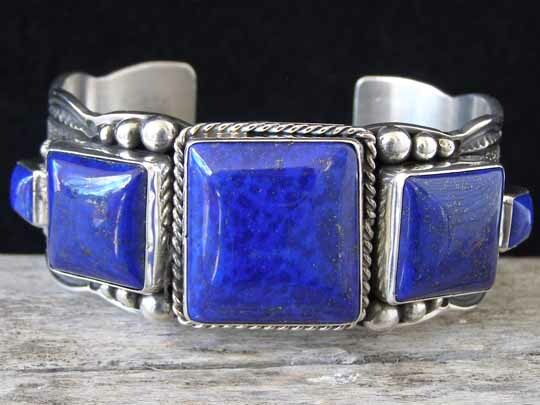 This bracelet is set with graduated square stones of natural, untreated Afghani lapis lazuli. The center stone is not a perfect square, but so close to it that one must measure to prove otherwise. Many men have asked us for square or rectangular stones in bracelets, but we find this looks great on women as well. This is simply the best deep blue lapis to be found. We gave this set of stones to Guy Hoskie and specified the size and width of the cuff; leaving him to determine how best to flatter the group of stones through his use of deep, biting stampwork and decorative elements such as appliquées, twist wire and raindrops. Hallmarked GH with the word Sterling stamped between his initials. Stones: center 1" x 15/16"; left & right 11/16" x 11/16"; far left & far right 5/16" x 5/16"
Width of cuff: 1 1/8"